for the 4 Little House on the Prairie, the Musical tickets is..
A few days ago I shared about a new musical coming to the Fox Theater next week, Little House on the Prairie, the Musical. 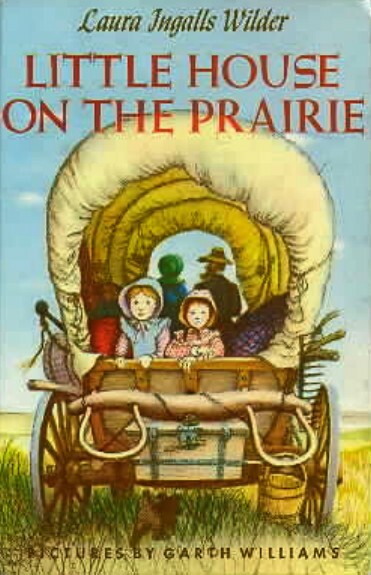 I know the Little House series is popular among homeschoolers, just for pleasure reading or to use with curricula such as The Prairie Primer. For a fun field trip, the Detroit Public Library's Burton Historical Collection includes Laura Ingalls Wilder's manuscripts for The Long Winter and These Happy Golden Years. No matter how you incorporate it, Little House is such a great, wholesome series to use in your homeschool. Homeschooling or not, most of us will remember watching the Little House on the Prairie TV series, which aired 1974 - 1982 and starred Mellisa Gilbert as Laura. I remember what a bully I thought Nellie when I watched the show as a little girl! It will be great fun to see Mellisa Gilbert play Ma in the musical! The winner will be selected and contacted by the sponsors on Monday, Nov 30, 2009, who will be gathering the entries from this blog post. I will be notified of the winner so that I can announce it here as well. Tickets will need to be picked up at the box office 15 minutes before the show. Because of the time sensitive nature of the tickets, the winner will be required to respond to claim their tickets by Monday, Nov 30th at 3 p.m., otherwise another winner will be selected. If you enter, please be sure to check your email and this blog regularly on Monday! Be sure to leave another comment for any of the additional entries! That gives you a total of four opportunities to enter! You have until Monday, November 30 at 10 a.m. to enter. The winner will be selected randomly and notified by email, so make sure you have your email address clearly noted in your comment! Do you remember Melissa Gilbert who played Laura Ingalls in the television series? She is starring as "Ma" in this stage show coming to Fox Theater in Detroit, December 1 – 5. Very fun! Our family has been selected to go to the musical on opening night as "Little House Ambassadors" and I will be happy to share our experience the following day! I'm hoping it will be a great show and we are very excited! As part of my involvement, I also get to share with friends a code for discounted tickets. If you'd like to enjoy this wholesome musical with your family, be sure to use the discount price code FAITH when purchasing your tickets. Detroit is the third stop of this musical tour. If you aren't in the area, check out the schedule for a show near you. We aren't a huge sports family. I think my husband went to one football game in college at our Big Ten university. I bought season tickets one year, at least. However, over the last couple of years my husband has watched quite a bit of football. I'm not sure what initially sparked the interest, but it has been a fun past time for father and son to hang out. 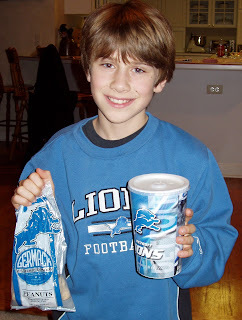 Yesterday, my husband took my son to see his first NFL football game! Better yet, the Lions actually won! How often does that happen? I think he would have been thrilled to go whether there was victory or not, but he looks pretty happy as is, doesn't he? Q: why did the cow run frantically across the road? Q: How do you tell a cow is exceptional? Q: What are a cows favorite subjects in school? I'm not sure what it is about cows that makes them so udderly funny! Perhaps it is because they are such simple creatures whose main job is to graze, moo, and provide for our tables. At the mention of cows and farms, we often think of a time in American history when family farms dotted the rural Midwest. However, have you ever wondered what it would be like to run a family farm in the present day? Now you can, with Life on the Farm. Keith Gohl, a midwest 3rd-generation dairy farmer in Minnesota, came up with the idea of Life on the Farm after a fun evening of trying to explain the ups and downs of farm life to his city cousins. Players get to step away from their fast-driven city life and experience the adventures of milking cows, fixing tractors and tilling the land. Each player starts with $10,ooo and no cows. As players move along the cow path, they acquire cattle and experience events that happen on any real-life farm. Players may have to pay neighbors to help them gather escaped cows because a hunter cuts the fence, at $10 per cow. A cow may be hit by a car, removing one from the herd. Not all the squares result in loses. Heifers mature, adding cows to your herd and there is opportunity to purchase more cows each time you land on Cattle Auction. When player makes a round the board, they collect "Milk Money" for each cow. There are both Expense and Income Card spaces, adding more fun and surprises to the game. Income cards involve events that bring cash to the farm, such as collecting an inheritance from a late uncle, selling bushels of corn, or receiving a cow from another play for past help. Expense Cards have money going out the barn door and involve paying taxes, vet bills, and filling fuel barrels. The first to retire with 60 cows and the original starting money wins the game. Winning sounds easy, until your herd starts growing. Just like real farm life, the larger the herd the quicker you earn - and lose - money. Life on the Farm was a hit with my whole family. Throughout the whole game we were all counting our cash and cows. Who knew one could be so competitive over cows? Those with larger herds would be feeling pretty good about the farm when the "Milk Money"was collected, only to grumble when a vet bill arrived through an Expense Card. As in real life, when a farmer is forced to slaughter a cow, and receives income as a result, that farmer has to report the amount received as income. Doesn’t make too much sense does it? But that is the way it works and so that is the way it is played in our game. While I like that the game really does reflect true life on the farm, I have to say that this card brought out the mad cow competitiveness as being unfair. It was a certain male adult family member that declared the card be changed to collect more for a slaughter than a purchase. I proposed a government subsidy be added to the card to offset the loss! What was really neat about the discussion is that our kids learned a little about business and real life. My oldest even asked for more "business type" games. I love that this game was easy to play, enjoyed by every family member, and taught a bit about a life style that is unfamiliar to this suburbia family. Probably the only downfall to the game is it can be rather long. A short version suggested only 30 cows and $5000 to win. My family probably played for 1 1/2 hours and no one had reached 60 cows, so we move to the short version. The winning criteria is completely "tweakable" without changing the rest of the game. Name your winning cow herd and dollar amount for the time you have to play. Life on the Farm is a prime choice as a Moo-y Christmas gift. Both city folk and country bumpkins are sure to find it moo-velous and udder-ly fabulous. 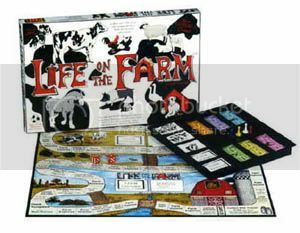 Life on the Farm can be purchased for $25 at the WeRFun website. It is lalso available at Kmart, where a current sale promotion on toys runs through Nov 25! I've read numerous times the benefits of getting kids moving while learning. To increase retention, experts recommend activities such as tossing a ball back and forth while learning spelling words or performing jumping jacks while reciting multiplication tables. I've found the science behind this theory to be valid. My daughter used to reduce the time required to memorize AWANA verses by jumping rope with the words. A mini-trampoline in our school room has also been utilized to set physical rhythm to items for memorization with successful results. An added bonus is that my kids are getting a bit of exercise in the process. This movement and learning correlation has been embraced by Gymathtics, an exercise DVD by Exploramania. In this 30-minute DVD, Carrie Scheiner, Exploramania founder, leads four young people of various ages (age 6 - college, meet the cast) through exercises integrated with math instruction . You can read about Ms. Scheiner's inspiration for Gymathtics here. Four exercise segments appear on the DVD: Shape Stretches Warm Up, Counting Calisthenics, Pattern Power, and Well-Being Wind Down. The following video shows a clip from each section. The math concepts taught are approximately a 2nd - 5th grade level. Basic geometry is taught in Shape Stretches, counting (odd, even, place value) numbers in Counting Calisthenics, and patterns (using sequence of exercises) in Pattern Power. The last segment, Well-Being Wind Down, does not include any math concepts. Instead, this segment focuses on relaxation and lifestyle sayings in combination with the stretches. While I like the concept, this DVD didn't go over well in our household. The age of my kids, 10 and almost 13, was most likely a contributing factor. Not only are my kids beyond the math concepts, they felt the DVD was a little too cheesy to make it tolerable. I tend to agree with the hokey assessment and I found the numerous high fives between cast members a bit irritating. Of course, I've never been one for a Richard Simmons approach to exercise. We have numerous exercise DVDs geared toward kids collecting dust in our household, an indication that the anti-Richard Simmons movement is genetic. I think younger kids, perhaps in the age 5-8 range, may have a better appreciation for Gymathtics. The exercises are easy enough for younger ones, but still provide a good workout for various ages. I liked that there are several ages in the DVD with varying abilities. This will avoid discouragement among viewers. If exercise DVDs are your thing, Gymathtics would be a productive method of getting the wiggles out while learning. Save time by doing PE and math review at the same time! For the math concepts, I liked the Shape Stretches the best as I felt it most successfully merged the physical body with the math element. I would have liked to see the math carried through to the last segment, Well-Being Wind Down. Instead of math instruction, comments like “Eat healthy foods in moderate portions,” and “Respect and appreciate people and the planet,” are said throughout. While some respond well to this sort of encouragement, it just adds to the hokey factor for me. It also struck me as a rather abrupt shift away from the math in the rest of the DVD. With the cold weather approaching, this DVD may be the perfect tool to keep your kids appropriately active indoors and a welcome change to seat work. 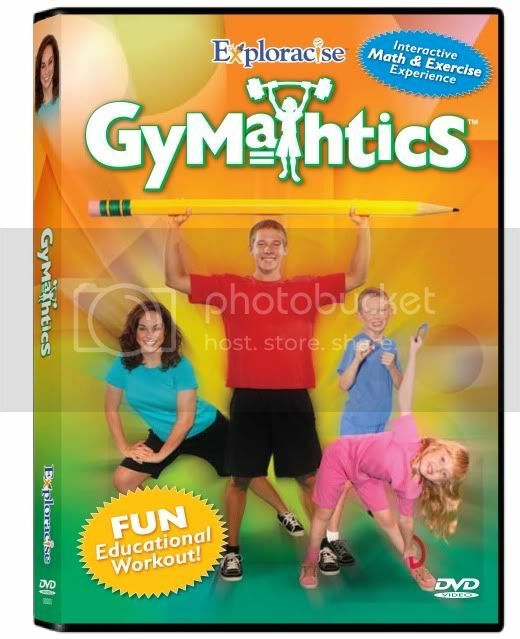 The award-winning Gymathics can be purchased for $24.99 at the Exploramania website. You may also be interested in the second of the series which targets 4th-7th grade, Gymathetics 2.0, due to be released soon. A few years ago, I was trying find resources to help my son, a struggling speller. My search led me to pick up the phone and chat with Don McCabe, founder of AVKO. AVKO is a non-profit, 501(C)3 membership organization that focuses on the development and production of materials and especially techniques to teach reading and spelling, handwriting (manuscript and cursive), and keyboarding. AVKO is dedicated to the teaching everyone how to read and spell, regardless of their mild to moderate learning disabilities, dyslexia, poverty, or opportunity. You may be familiar with Sequential Spelling, a spelling program that teach spelling using the patterns of the English language. While Sequential Spelling can be used with any learner, dyslexic students in particular benefit from the breaking down of words. In addition to Sequential Spelling, AVKO provides a variety of support products and information for teaching spelling. To my surprise, Mr. McCabe didn't spend our phone conversation convincing me his program was my answer. Instead, he simply discussed with me my questions concerning dyslexia. The AVKO headquarters is located less than an hour from my home and Mr. McCabe even offered me free tutoring for my son. He was quick to stress that I could teach my son and he would teach me how to do so if I was unsure. I was impressed at how much time Mr. McCabe spent with me, at a time when I was having trouble getting answers elsewhere. In gratitude, I decided to support the non-profit AVKO and become a member. At the time, an AVKO annual membership provided a print copy of To Teach a Dyslexic, three e-books, and 25% off any purchases for the duration of the membership. I read the book and purchased a few products, but didn't renew as I felt I gleaned what I was going to glean that first year. When I received a 1-year AVKO membership for review as a member of the TOS Crew, I was curious to see changes in membership benefits have taken place over the last couple of years. An annual membership ($25) to AVKO gives 25% off all AVKO printed materials for the year, as well as access to a new membership section on the website. While membership does not include access to the Sequential Spelling program, you can develop a spelling program on your own with the information available in the membership area. Visit the website for a list of the Benefits of Basic AVKO Membership, including titles available for download in the Members Only area of the website. There are several items that were not part of the membership when I was a member years ago. One of the items I was absolutely thrilled with was The Patterns of the English Spelling, Volume 1-10. This was an item I would have loved to have years ago, but the $360 price tag for all 10 volumes in a printed version was well outside of my budget. I'm thrilled to see this 1631-page PDF document included FREE with membership. Mr. McCabe spent an immense amount of time (over 30 years!) creating this categorization of every word imaginable into word patterns or rimes. If your child is needing work with a particular pattern, you will have no trouble finding words for practice and example. You can see a sample of this PDF file here. I also enjoyed some of the audio recordings from some of Don's workshops, also new resource with membership. There are six total, a $15 value. Also of interest is AVKO's pairing with Spelling City. With the resources available to members, members will be able to create individualized spelling lists for a completely customized spelling curriculum. In addition to the main titles, there is also a section of humor, puns, and stories for fun and to use during lessons (dictation, for example). A word of caution – do not blindly print items without viewing and hand them to your children. Some of them contain humor that might not be appropriate for some families. Is this a membership for you? If you already use or are considering AVKO's Sequential Spelling program, the supporting information in the member's section will certainly be useful. In addition, the savings on future purchases will help offset the cost of the membership. Parents of struggling spellers will find tools to use with their current program or to develop your own program. While there is a lot of interesting information on this site, if you have natural spellers that rarely need to reference Mr. Webster, then you may not find a membership all that beneficial. To learn more about AVKO, the products available, and the benefits of membership, visit the AVKO website. Off to the State Championship! I didn't fathom that it could possibly happen, but our rookie FLL (First Lego League) team is off to the State Championship on Dec 12th after placing in Regionals today! A team was literally thrown together when a local university offered grant money to sponsor a team. The kids got off to a slow start and had many hurdles to jump before things starting really got going. Most of them didn't know each other and there was a variety of personalities in the mix. The families were spread all over our very large county, making meeting regularly enough a bit of a logistical problem. A good half of the kids had never even used the Lego Mindstorm program needed for competition and two families dropped before it was all said and done. Honestly, we were all in this for the learning experience for the kids. We figured they could go under low pressure this year and gain a better understanding of what it was all about for next year. It wasn't until midway through the regional competition today that we realized they had a good possibility of making it to State. It is amazing what kids can pull off with a bit of determination. Now we are off to the State Championships! Way to go team! While homeschooling can be done inexpensively, most homeschoolers I know are working hard to stay within a homeschooling budget. There are so many great sounding products that compete for those scarce green bills. With a plethora of reviews introducing new products appearing regularly on this blog, I sometimes feel like I'm contributing to the overspending of budgets. However, this review is a bit different from previous reviews. The product is completely FREE! AHEF is a non-profit, non-partisan educational foundation dedicated to the understanding and teaching of America's factual and philosophical heritage to promote constructive citizenship and Freedom, Unity, Progress, and Responsibility among our students and citizens. AHEF accomplishes this patriotic mission by writing, producing, and distributing FREE K-12 lesson plans to teachers, students, and families in all 50 states and through additional initiatives, programs, and partnerships. AHEF sent me a copy of their CD version of this no-cost K-12 resource for review. Included on the CD are three levels of materials, elementary (also in Spanish), middle school, and high school, with approximately 185 pages each. Each level includes 15 lessons based on four key themes. These themes, Freedom, Unity, Progress and Responsibility, are described as "A Formula for America" by the founders of AHEF. Each lesson clearly states the purpose, objective, theme, NSCC standards, time, materials and preparation required. For the elementary level, coordinating passages from the Core Knowledge series are noted. Additional articles and reading material are included as well as printouts. Following each level is a teacher resource titled Religious Expression in Public Schools, covering a topic where misinformation is common. While the lessons are intended for a classroom or group environment, many of them can be modified for use with individual students. Many of the worksheets could easily be used with whatever civics or history curriculum you currently use. For example, text scrambles of the Declaration of Independence, the Preamble of the U.S. Constitution in sign language, or president card printouts can be used independently of the lessons. The multiple levels on on CD are perfect to coordinate lessons among all of your students. While the lessons for each level don't completely align, there are several topics, e.g. the Declaration of Independence and the U.S. Constitution, that appear in each level. While I likely won't use the lessons fully as presented, many of the accompanying activities will fit in nicely as a supplement when studying American history or civics. As a resource that is FREE to all, this is certainly a supplemental resource that fits in to all budgets. America's Heritage: An Adventure in Liberty is available as a direct download or can be ordered on CD. You may also request a print copy in a binder for $19.50 per level. Visit the American Heritage Education Foundation website to find out more about this non-product foundation and to find more about the lesson plans. If you've followed my past postings, you've may have picked up that I have trouble getting history into our studies. I know, I know...I wonder if I'm a "real" homeschooler too. Most homeschoolers love history, don't they? I sometimes wish I shared that love of history I see among the homeschooling community;I just didn't have a good example of how to enjoy studying history. All I remember about my high school history studies was the sheer joy my teacher took at boring us to tears. Really. She was not a nice woman. The end result is I dabble, but never manage any systematic history studies. Having my kids read and listen to a ton of historical fiction has been fairly successful. However, I must admit that I've been feeling the pressure with an upcoming high schooler. It seems like our history studies need to have a little more oomph and direction for high school credit. Ironically, I've been blessed with a several history programs to review since my time with the Crew. Wow. That high school history teacher really did me a disservice. History isn't all that bad! I've been very pleased with the latest history curriculum that has come my way - All American History Volume 2 by Bright Ideas Press. All American History Vol 2, for grades 6-12, covers the Civil War to the 21st century. The author, Celeste Rakes, developed the All American History curriculum as a result of teaching history in a homeschool co-op classroom and having difficulty finding a curriculum that met her criteria. With a history degree and experience teacher her own children and others, she had definite ideas of what she desired in a curriculum. Rather than a boring fact-regurgitating curriculum, she desired an engaging curriculum that told the story of real people through the ages. The end result is a curriculum that provides structure with a chronological and thematic presentation of material while including reading opportunities, writing projects and artistic/hands-on work to enhance the textbook. The set comes with a Student Reader, a Student Activity Book, and a Teacher's Guide & Answer Key. The text, or Student Reader, is broken down into four units with eight lessons each. Each lesson is about 12-14 pages long. The reader is texbook style, but does have plenty of black-and-white pictures of people, places, and events discussed in the chapter as well as maps for further understanding. Each chapter concludes with a bullet-point “Impact” section that summarizes the main points of the chapter. The suggested pace is to complete one chapter a week. Define the political terms referendum and recall. Why do you think the Progressives favored enacting these measures? The chapter review quizzes are in a traditional style with a collection of true and false, matching, fill-in-the-blank, and multiple choice questions. While it is sold separately, the Student Activity Book is considered not optional. I agree that one should not go without the Student Activity Book; it is an integral part of the curriculum. The Teacher Guide & Answer Key starts out with a clear explanation on how to get the most out of the curriculum. Suggestions for adapting for younger or older children, a co-op, classrooms, or a family studying together are included in this section. Section Two includes teaching resources for each chapter. Project possibilities, timeline dates, review games, and suggested family activities are all included. Section Three has supplemental book lists for each unit divided by ages K-4, Middle (5-8) and Secondary (9 and up). Section Four contains the answer key to the “For Further Study” questions, including younger student adaptations. The last section, Section Five, is the answer key to the Student Activity pages. I often elect not to purchase teacher guides, but this one contains valuable information and I would recommend not skipping out on it. I originally started this curriculum with my 5th grade son. I found it to be just a bit much for him, especially considering that we are not accustomed to including history in our main studies on a regular basis. Our biggest obstacle was the notebook writing portion and remembering of details for the notebook pages. At first, I didn't realize the notebook pages were to be done while reading the text and we were doing them after the fact. Switching to completion while reading helped some. My son enjoyed finding the appropriate image and flag for each page. With the suggestions in the teacher guide, I believe adapting Vol 2 would have been obtainable. However, I soon realized that Volume 2 was just about perfect for my 7th grade daughter's needs. Overall, I found this to be a well-thought out and thorough history curriculum that caters to a variety of learning styles. The activity pages are not overwhelming for the target grade levels, yet really solidify the learning and keep the student engaged during the reading. With two very different learners in my home, I appreciate that the author provides many suggestions to make this curriculum adaptable. This is actually a curriculum that I can use with both of my kids. I like the structure the textbook provides in combination with the supplemental reading suggestions, games, and activities. It gives me the systematic approach I've been seeking, yet takes the bore out of a pure textbook approach. One of the dangers of being on the Crew is that I often end up making more purchases as the result of liking the products I review. Such is the case with All American History Vol 2. In the end, I ended up purchasing All American History Vol 1, covering Exploration - 1840, for grades 5-8. Volume 1 has the same format as Volume 2, but the chapters are slightly shorter. The level of Volume 1 worked better for my son, yet is still appropriate for my 7th grader. We'll follow up with Volume 2 next year. All American History Volume 2 can be purchased as a set for $68 (a savings of 16%) or the Student Reader, Student Activity Book and Teacher Guide can be purchased individually from Bright Ideas Press. You may also enjoy the All American History Yahoogroup for users to share ideas. Bright Ideas Press also publishes many other products, including the popular Mystery of History and the new Illuminations. Check out the website and also visit the TOS Crew official blog to read more reviews on All American History and other Bright Ideas Press products. Doing a unit study? Wouldn't a word search or custom handwriting sheet based on your study be great? Or perhaps your child needs a little extra practice on a concept before moving on in the textbook? Is an extra page of triple-digit multiplication in order? Have you ever gone on an internet search with a particular worksheet in mind? If you have, you may come across the abcteach website, with over 5000 free printables and worksheets available. However, the free printables are just a small sampling of what is available through an abcteach subscription. What is the benefit of subscribing to abcteach? For starters, members have access to over 35,000 printables and worksheets, with new material being added each week. Categories range from basic subjects to theme units to seasonal worksheets, covering levels pre-K- 8th. Also included are an extensive clip art gallery, with over 6,500 options, and abctools. If you are interested in custom worksheet, abctools is your answer. You can try this worksheet generator out on the website with sample documents. For a video tour and a complete list of membership benefits, click here. I was given a 1-month subscription to abcteach in order to do this review. I found all they have to offer is a little bit overwhelming! There are worksheets from basic multiplication problems, book units, games, parent resources, graphic organizers and everything in between. At the time of my membership, my daughter was taking a persuasion writing class and had just covered common fallacies in class. I was surprised to find a complete collection of worksheets on logical fallacies to reinforce what she learned in class. I particularly liked the abctools for custom worksheets. It seems that every time I search the internet for a specific worksheet, I come away empty. With the abctools, you can quickly create worksheets on any topic specific to your needs. Now, I have to admit that I'm not much of a worksheet gal when looking for supplemental material. If I were, abctools would definitely catch my attention. I tend to look for online video clips, DVDs or games instead, but there are occasions that I have a specific worksheet in mind and I just can't find it. An abcteach subscription would be perfect for such an occasion. I can see large families with several children in the pre-K-8 range benefiting from such a subscription as well as co-op teachers. We homeschooling moms are busy enough that we don't need to be spending our time searching for worksheets on the internet! You can purchase an abcteach subscription for $40 per year* for individual users. There are also discounts available for group purchases, starting at 10 or more. Gift memberships are also available. Visit the abcteach website to find out more about the offerings or to buy a subscription. *Note: Through Nov. 30th, Homeschool Buyers Co-op is offering abcteach at a 50% discount!